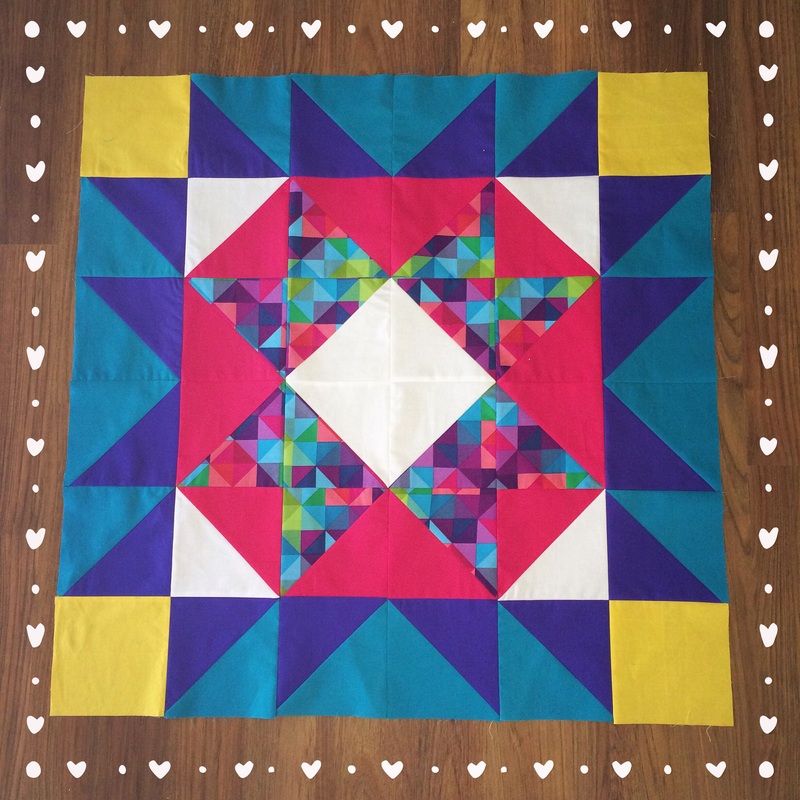 I saw this amazing quilt on Pinterest from Sew Katie Did, and fell in love with it immediately. You an see the full post here. I love its clean lines, geometric shape, and the quilt colours. After seeing it, I was inspired to try my own. 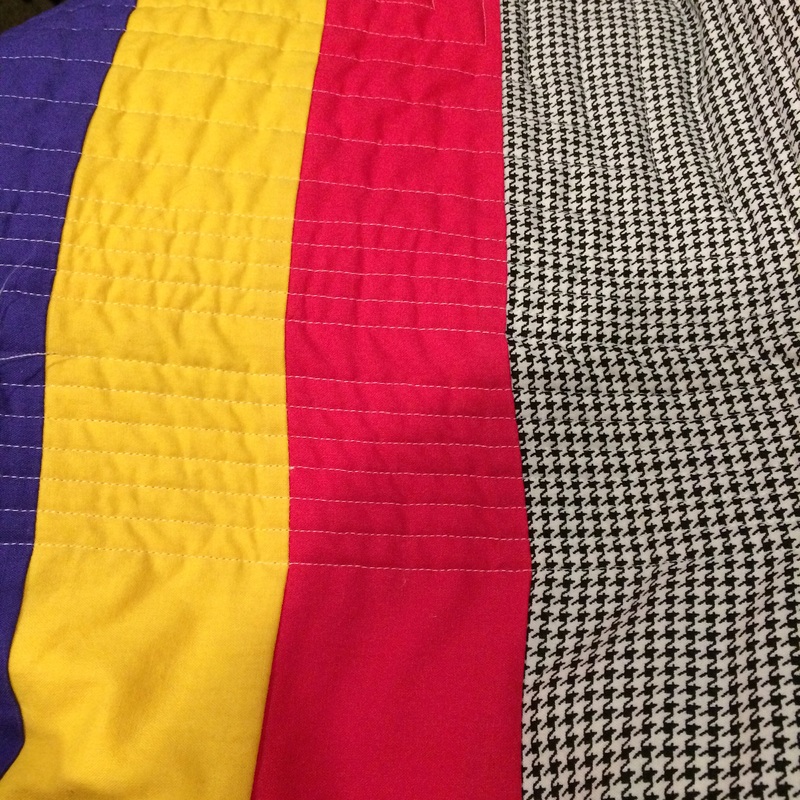 I pulled fabric for this quilt in a matter of minutes – it came together so easily and I couldn’t wait to get started when I had prepped all my fabric. I love the pink and the geometric pattern in the middle especially. I’m up to quilting the back, but I REALLY need your help, so I hope you’ve made it this far reading! I’ve run 4 colours from the quilt top on the back horizontally. I’m about half way through quilting, and I’ve just seen that the back is starting to pull, causing the horizontal lines to go crooked, which isn’t a great look. I don’t know why this is happening .. It’s never happened to me before! I didn’t make any changes to the tension, only the speed control. I’m using a walking foot, and sped up the sewing speed for these few lines. That’s the ONLY thing I can think of that has changed. I’m going a little crazy. I love this quilt, and had planned to sell it, but I’m feeling so deflated about it. I need to spend another night with my seam ripper to take out the 6 lines of quilting, in order to pull the colours back in line. I’ve been doing a bit of research and someone mentioned it could be the presser foot pressure … We’ll see!